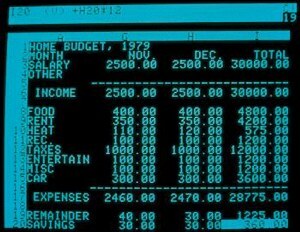 Early spreadsheet software, to be considered the first „killer app“ for Personal Computing and the first application that convinced people to invest in whole systems (the Apple II). First software that went through a whole software career cycle, until its decline fueled by competitor „Lotus 1-2-3“. Also notable for its good documentation at that time.